Wranglers that are selected to work for The Natural Connection INC not only have the best job, working with horses and customers on the beautiful trails of the Marriott Ranch, but also, the most challenging. They are responsible for keeping the customers safe and happy, as well as keeping the horses safe and happy. Wranglers in any capacity are required to participate in a minimum of 4 paid hours of Continuing Education training per year. This includes, but is not limited to learning more advanced riding skills, training green horses and problem horses, teaching riders, holistic horse care, western medicines, eastern medicines, horse management, horse nutrition, horse feeding, horse emergency care, and for human care, a CPR and First Aid certification is encouraged but not required. The personality of a Professional Wrangler will exude honesty, equality, sincerity, humility, and integrity. The Natural Connection INC sets a standard of excellence at all times for our Wranglers. On the same note, this is a very tight nit group of individuals that understand that there is no "I" in the word "TEAM." Team players work well together in high stress environments and rely heavily on good communication with each other to ensure the safety and well-being of the horses and riders. If you are interested in learning about the Wrangler position, please go to the attached links for both the Application for Employment, and Job Description. 3 professional references will be required and applicants should expect an "in-office" interview, potentially followed up by a "working interview" out on the trail. KAI HOLLE is a lifetime horseman that has ridden and competed internationally. He has ridden multiple different disciplines throughout his life, and has had vast experience with training horses. Currently, he assists The Natural Connection INC with both his farm management skills and his riding skills. KATARINA FRENCH has been riding since before she was born, as her mother rode up until she was 7 months pregnant. She learned to ride on her mom's roping horse, Barney, and then moved to English riding and jumping for a while. Kat is currently learning to train her own horse, a BLM Mustang named Desperado. KRISTEN ANDERSON has been riding since she was 9 years old. She rode and competed in multiple disciplines, including western & English pleasure, stock & hunt seat equitation, trail, and dressage. During college, she worked at barns doing odd jobs just to be around horses, and her first job after graduation was working as a horse carriage driver on the Seattle waterfront. She now owns three horses and some goats! She lives with her husband, who also enjoys riding the trails whenever he can. Kristen's goal with The Natural Connection INC. is to keep learning and advancing her horsemanship skills every day, and to continue her lifelong journey with horses as part of an amazing team of wranglers. She hopes to help our customers get the most out of their experience riding with us, because there's nothing better than taking in the spectacular countryside from the back of a horse! LISA LAUNDREE rode from an early age and rode english all through college. 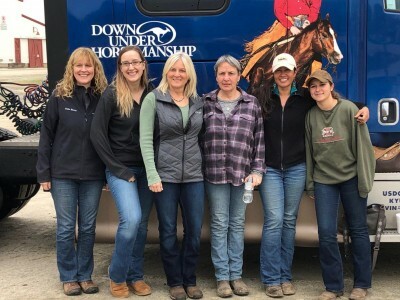 She took a break and was happy to find a place where she could not only learn more about connection to horses, but become the horsewoman she's always wanted to be. CLAIRE ANSTEY has been a life long horse lover, running a small boarding facility at her home. She has experience in driving horses and is excited to join the team and learn about training horses and riding them in a more united way. JULIA BAUER, once upon a time, not too long ago, found herself making a bucket list on a rainy afternoon. First item on the list was learning horseback riding. Google led this greenhorn to Ms. Jean's Natural Connection and she became inspired by her passion for horses. Under the tutelage of Ms. Jean, the past six years have been an amazing adventurous journey of self discovery for Julia. As a wrangler at the ranch, she has an exciting new goal this season to refine her skills with the Clinton Anderson method, by training a horse from the ground up. NATASHA WALTERS took lessons, dressage and hunter/jumper, as a kid, however never really felt at home with the barn she was learning at. That changed after starting to work with Jean at the The Natural Connection INC. Her full time job is a veterinary technician which leads her to have a passion for animal husbandry and be an advocate for four-legged patients. The Natural Connection INC helps her to continue to be an advocate for horses and have fun while honing her own skills riding as well. Natasha's goal here is to continue to learn communication styles and train horses, help Ms. Jean to provide amazing care for the herd at the ranch, and help bring our customers into our circle (even if for a few hours!) to learn about horses and how they can enrich our lives. DARIAN POLES was introduced to The Natural Connection INC through a family member. Darian worked hard to provide physical labor at the farm in exchange for learning how to ride horses and learn about horsemanship. When he is not in college in PA riding with his western equestrian team, he enjoys his summers here at the ranch, learning more about horses and riding. SARA LEONG has been riding for four years. She rode both English and Western and is currently in school. Her goal with continuing horsemanship with The Natural Connection INC. is to continue learning to be a better rider, trainer, and wrangler. Sara loves the ranch because of the beautiful scenery and unbeatable experience. ABIGAIL HOLLE, "Wrangler in Training." Although she is too young to be put on payroll, living here, she is exposed to horsey stuff everyday and someday aspires to become a Wrangler for The Natural Connection INC. She even started her riding career in a lead line class at the Upperville Horse Show!